On Wednesday morning I received a large, fairly heavy jiffy bag from one of the UK’s biggest PR agencies. 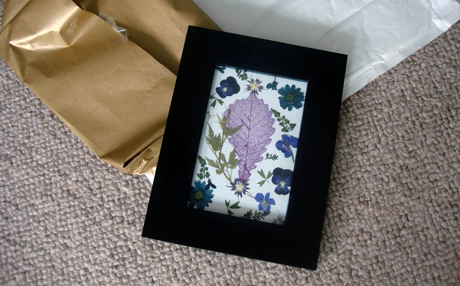 I opened it to find a wrapped package, tied neatly with string, inside of which lay a dark wooden frame with a variety of pressed flowers inside it. There was nothing else: no press release, no note, nothing. I even checked inside the frame but all that was in there was a little bit of paper with WHSmith written on the back. What could it possibly mean, I wondered. Had I been selected for some kind of exclusive press trip? Or was it some kind of award for two years of amazing movie blogging? Or a symbolic death threat? As it turned out, it was promoting the Girl with the Dragon Tattoo DVD release (the significance of the pressed flowers has now come flooding back), and they’d forgotten to put the press release in. Not that exciting after all. Still, something to put ‘on the mantle’.